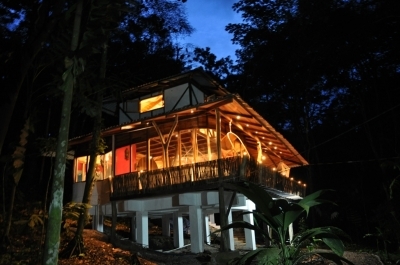 El Arbol - Luxury Jungle House with Jacuzzi! Fascinating jungle experience in the middle of the Caribbean rainforest of Costa Rica! Our distinguished lodge on 16+ acres of private property is situated in the Gandoca Manzanillo wildlife refuge, with the beautiful Caribbean sea less then a mile away. You will stay in our luxurious, fully equipped house on stilts. Let comfort surround you while you are relaxing in the Costa Rican rain forest, drinking a good bottle of wine on your jungle porch. Have a massage, walk our private nature tracks or relax at the creek that runs through the property. Go on one of the many excursions we can arrange for you. Visit the picture perfect & quiet Caribbean beaches just a few minutes away! Venture into Cahuita National park or the Gandoca Manzanillo wildlife refuge. Enjoy a night out in the bustling beach town of Puerto Viejo (9 miles away). But most of all look forward to waking up in a jungle paradise that seems to be created especially for you. You can look at our website and use PayPal for the deposit of 50% of the total amount, the other 50% we prefer cash upon arrival. We have another identical unit available, please contact us for details. El Arbol philosophy: Our philosophy is to create a unique and personalized jungle experience in the midst of complete comfort. Feel the mental and physical wellbeing that nature provides. We also place extra emphasis on being eco friendly and globally conscious. You as our guest take part in this process as 5% of your lodging fees will be donated to local charities. Our houses are beautifully and interestingly designed. They are built on poles so you have the feeling you you are living and sleeping in the treetops and have round shapes, rich colors and exciting features. Every house has its own jacuzzi from which you can see the jungle and its wildlife. The houses have a fully equipped kitchen, master bedroom, large living room with an extra sleeping sofa/bed, luxury bathroom, safe, air conditioning (at extra cost) and all beds have the best orthopedic mattresses with good quality mosquito nets. The houses have a fully equipped kitchen and beds with the best orthopedic mattresses. Ask about our additional Convertible Beds! We can do your laundry for 10 $ a load. 4+ guest at $25 a person up to 6. Deposit of 50% of total cost required! Ask us about available activities & services!